Discover which is best for your dog. Installing a pet door in your home provides freedom for your pet and convenience for you. No more getting up in the middle of the night to let your pet out or interrupting a movie (or even dinner). According to some dog experts, pet doors are actually good for your dog. By giving your pet the freedom to move in or out of the house at will, you help to build their self confidence and help to eliminate common behaviour problems such as housebreaking, clawing of furniture, destructive chewing and even excessive barking. Dog doors are not a substitute for proper exercise for most dogs or puppies and should never be an excuse for leaving them alone for long periods of time. No more doorman duties all evening! No more scratched doors or chewed carpets! No more night time trips to let your dog out! No more guilt feelings when you get home a little late! No more accidents in the house! Plenty of things to do outside when he gets bored! He can come inside if it's too cold or too hot! Confidence increases, because he can "choose" where he wants to be! There are a number of types of pet doors to choose from, from simple plastic flaps to top of the range automatic and patio doors. As long as you buy the correct size then the type is down to personal choice and budget. Most doors are rectangular (obviously!) so all you need to work out are the OPENING WIDTH: a little wider then the widest part of your pet and OPENING HEIGHT: measure from the top of the shoulders to the chest of your dog just behind the front legs. If you have a puppy you will need to allow for his adult size! 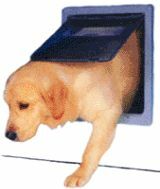 This will ensure correct size of dog door for your pet. Using the OPENING SIZE given in the manufacturers details, cut a hole in a piece of cardboard, and see if your pet can pass through easily. As dogs duck their heads as they push open their door and step through it, you should install the dog door with the top of the opening just above your pet's shoulder. However, any position will do as long as your pet can open and get through the door comfortably. Installs on almost any door with a snap! PetSafe's most full-featured pet door. Features the double flap system and a five-year manufacturer's guarantee. This versatile screened pet door allows you to create an opening in sliding or swinging screen doors or window screens. Accommodates dogs up to 30 lbs. Includes a manufacturer's lifetime warranty.